I wanted to say a HUGE THANK YOU to everyone who entered this special giveaway. The winner was chose at random and is GabrielaLane. Please contact me via the contact tab within the next 48 HOURS. If I do not hear from you, I will be chosing another winner. Thanks again everyone and keep your eyes peeled for when I reach my milestone giveaway (1000). A hint...YSL. This giveaway has been extended till the 30th April as I will be away and unable to choose a winner until I get back that day. I thought it would be good to keep it open till then so that you can get more entries in. The winner will be announced on the 1st of May. at 12pm BST on this post. Please check back to see if you have won. Ok, I can't believe it's been a year! Well I set this blog up on the 1st of March last year as I wanted an area where I could share my beauty and fashion reviews, tips and looks. I still can't believe I set it up. Now although I created it in March, some of you may know that it was offline for a while (so annoying!) due to technical issues. But luckily it was up and running again in the summer. I just wanted to show my appreciation to my readers. I can't believe the opportunities that have opened up to me from setting up an online diary of things I love. I'm truly grateful. 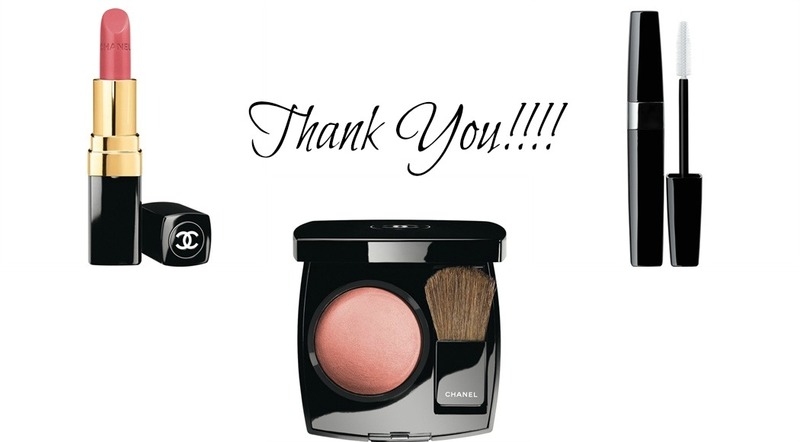 As a way of saying thank you, I am launching a giveaway to win 3 makeup items from Chanel. I don't do giveaways often (this is my second one) but thought I would make it worthwhile. 1. Chanel Rouge Coco Lip Colour in a shade of your choice. 2. Chanel Joues Contraste Powder Blush in a shade of your choice. 3. Chanel Inimitable Intense Mascara in a shade of your choice. This is an international giveaway. If you're under 18, please seek consent from your guardian as I will need your address if you are chosen as the winner. Don't forget to leave your details (email etc) in the comments below so I can notify you if you win! For rules to enter, please see below. Happy blog birthday lovely, and congratulations on how far you've come! Fantastically generous prizes, you're going to make someone very happy. My blog birthday is in a few weeks. Funny we started at the same time! Got my fingers crossed for the giveaway, yaayy! Congrats on the blog birthday! This is such a great giveaway, fingers crossed! Congratulations dear, and thanks for offering such lovely prizes. Amazing giveaway! Such a good prize, I've never tried Chanel before! oh my goodness, Chanel goodies...googly eyes hehe! Happy Blog Birthday, that's quite a long time of blogging! happy blog birthday! i turned 30 last month and have never owned a single item of luxury makeup so i'm hoping i win this haha. thanks for the giveaway and please keep up doing what you do! Followed & shared on FB, Twitter & Blog. I'm following you on Bloglovin and Facebook. I don't have Twitter, sorry! Hope i'll win, i'm a huge fan of Chanel products. Congrats on your Blog! I like it. Happy blog birthday, what a lovely giveaway! Following on Bloglovin, and on GFC as Rebecca Anne. Thankyou for this giveaway and Congrats! Congrats! That's so exciting! Thanks for the awesome giveaway. Just entered and followed all the rules. Amazing giveaway. Thanks so much for doing this giveaway it's so perfect. Keep on blogging, you're my favorite!!! Very generous prizes - thank you! Happy Blog Birthday, lovely! This is very generous. Joined the giveaway, hoping to win. Thank you for the giveaway :). Happy birthday ;). Happy blog birthday! Great giveaway!! World's best giveaway! I've never owned any Chanel makeup so fingers crossed! Following on BlogLovin as Kelly Commerford. love a Chanel giveaway thanks so much! Happy blog birthday! I can't wait till I can hold my first giveaway, I am so excited about it. I follow you GFC: Janet D.
I follow you via Bloglovin: Janet D.
Congratulations on how far you have come lovely and Happy Blog Birthday to you! It was absolutely lovely to meet you at the event and I do hope to meet you again soon. Lovely prizes, you're going to make someone very happy. Happy Blog Birthday! Such a generous giveaway, thanks so much! Congrats on your blog!! Thank you for the giveaway!!! Ah! Happy belated birthday lovely! Congrats!!! Thanks for the giveaway! Email: mybeautyjunction at gmail dot com. Already a follower via GFC - also following via Bloglovin - both under Jenny G.
My GFC is Kay Baninibeauty. Amazing giveaway, thank you, I'd love to try some Chanel make-up! !